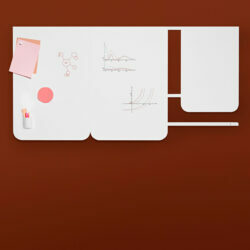 The magnetic, writeable Moving Panel is a versatile tool and the ideal extension of the mobile whiteboard Moving Wall. 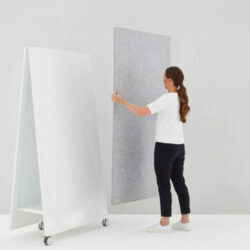 The wafer-thin, frameless panel is available in two functional sizes and can effortlessly be attached to the extensive Moving Wall. 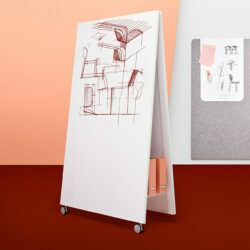 Alternatively, the lightweight Moving Panel can be used as a stand-alone writeable presentation surface on the wall by means of a rail-system or placed as a piece of paper on a table, responding perfectly to the requirements of highly flexible working environments and methods. 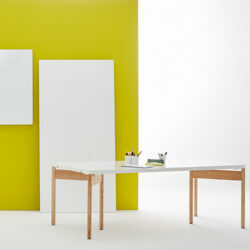 The mobile panel comes with the same high-end surface as the Moving Wall and is an ideal tool for conference rooms, offices as well as for residential settings.